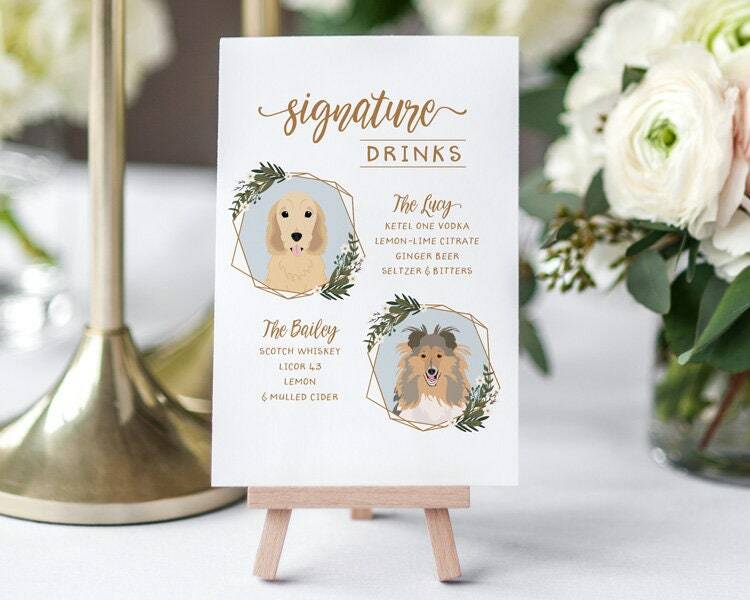 Want the perfect way to incorporate your beloved pets into your big day? Look no further. A fully custom pet portrait illustration in the form of a signature drinks menu. - In the Notes to Seller area upon checking out, please include: Signature drink/pet's name and ingredients. 3. Wait 2 weeks (i'm very busy at the moment!) for a digital proof. You may change any of the appearance attributes at this point. So over the moon with how this turned out !! We couldn’t be happier with our signature cocktails sign!! Thank you so much, we cannot wait to show it off at our wedding in July!!!! Simply amazing! Seller was so easy to work with and really captured both of our dogs perfectly. We are so glad that we are able to honor our pups in such a sweet way at our wedding. Thank you!